With this recipe, we have broken away from the traditional round pizza and made a square one. Served on the streets of Naples Italy. Topped with caramelized onions and earthy mushrooms. Knorr Italian Tomato Base forms the base of the flavour. 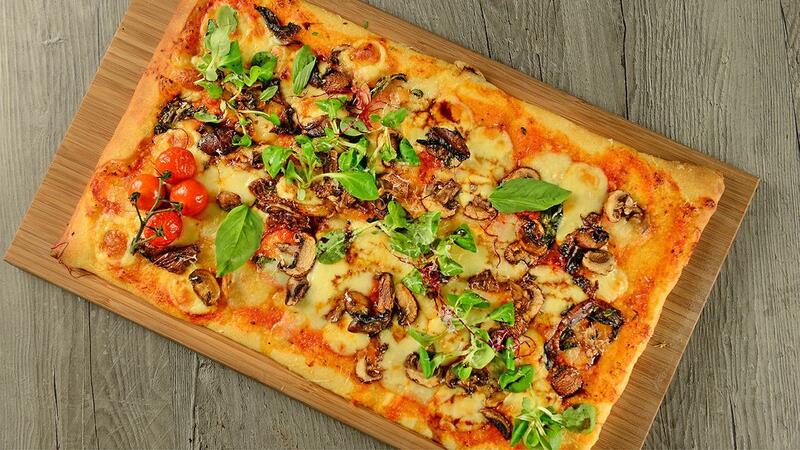 Your guests should love this pizza, check out our recipe below! Combine the flour, salt, and yeast in a bowl. Stir to combine. Add just enough water to make the mixture form a ball of dough with no dry flour left on the bottom of the bowl. Dust a clean surface and the dough with a little flour and roll it out into a rough square, about ½cm thick. Sauté the onions in a skillet over medium-low heat with olive oil for about 10 minutes, stirring the mixture every 2-3 minutes. The end result should be light golden brown, soft, sweet onions. Take the caramelized onions out of the skillet and add the mushrooms, along with a pinch of salt and pepper and the dried thyme. There should be some residual oil in the skillet to cook the mushrooms, if not add a tad more. Cook the mushrooms until all the moisture has evaporated away (about 10 minutes over medium heat). Adjust the rack in your oven to its highest position and begin to preheat to 220°C. The dough at this point should be at least double in volume and very bubbly. Sprinkle it generously with flour and then scrape it out of the bowl and onto a floured surface. Pat the dough down into a circle about ten inches in diameter. Transfer the dough to a large (16-inch) pizza pan that has been coated with non-stick spray and stretch/press it the rest of the way out to the edges of the pan. Spread the Knorr Italian Tomato Base over the surface of the dough with the back of a spoon. Sprinkle the caramelized onions and sauteed mushrooms over top. Finally, add the shredded cheese. Bake the pizza in the fully preheated 500 degree oven for 12-15 minutes or until the crust is golden brown. Sprinkle with fresh basil after baking, if desired.